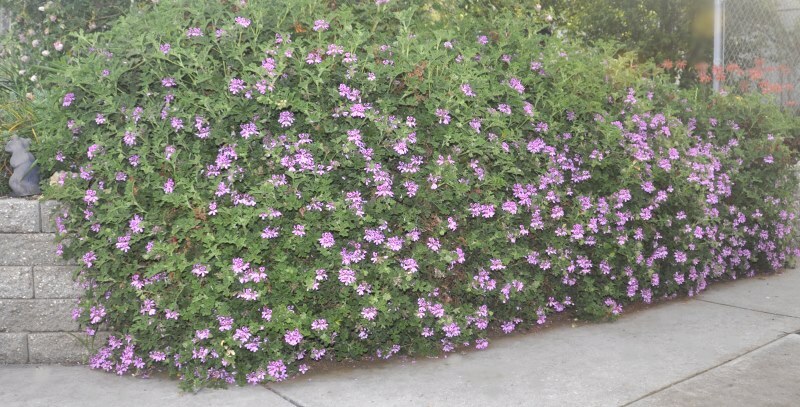 The Village Hill Oak Scented Geranium above is cascading down a three foot block wall and covers about 14 feet. It has been here for about 10 years. Some years a heavy frost will kill it back to the ground. Most years, though, it survives in this protected location with little damage. There is a giant Blue Oak that provides its canopy for warmth and the wall keeps the roots warm. It is sheared three inches above the concrete several times a year. It is such a prolific grower that it must be cut back on the edges and sometimes at the top. In early spring, the Village Hill Oak leaves will have a chocolate blotch that runs down the middle. By mid summer, when it is in full bloom, the blotch disappears but the flowers more than make up for it. It will bloom until frost. The fragrance of Village Hill Oak reminds one of walking through the woods on a rainy day. It is soft and inviting and lovely along this walk way. 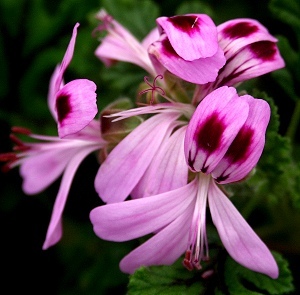 Scented Geraniums release their fragrance when brushed against or when watered. More on Planting, Pruning, Fertilizing, and Using Scented Geraniums. Village Hill Oak Geranium makes a great addition to our Zone 8-11 Fragrant Herb Garden Six Pack.